The Wild Blue Cherry kennel was registered by FCI in 2003, as follows it cannot show off long past. My name is Mrs. Katalin Németh, I live in the outskirts of Budapest with my family and with my dogs.I have bought my first yorkshire terrier, Xsara, after a long search from a reputed stock-breeder. We did the first steps in the world of dog-shows and dog-keepers infected me and soon I found myself walking home with my second yorkshire terrier baby. 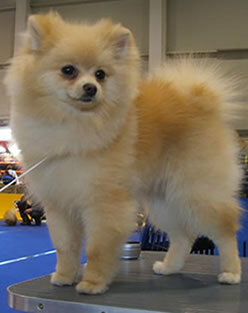 It is Life.Now we have four yorkshire terriers and four pomeranians.I visit dog-shows actively wether in Hungary or abroad. My dogs always do wel on this shows.They live in familiar ambience,so they are even-tempered, healthy and very playful dogs. If you are interested in the development of a new kennel, follow us with attention.